My last post at Library Garden was all about blogs attracting comments, and I continue to get comments and feedback about it. This morning’s post continues to highlight blogs, this time, in general and in detail. 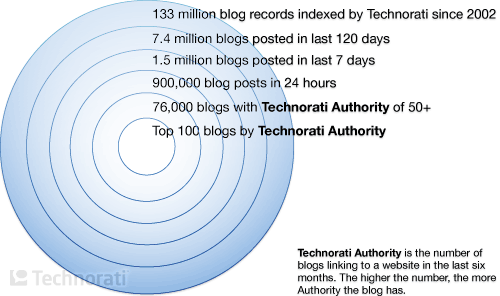 For the last few years, whenever I was explaining blogs to library and school administrators, especially regarding their impact and trends, the report(s)/site(s) I would demo first were the “State of the Blogosphere” reports from Technorati. I was and continue to be impressed with the amount of valuable material Technorati has collected about the blogosphere on its site, but since November last year, I have been wondering if they would continue with their “State of…” reports. In fact, I finally removed a slide from a Web 2.0 intro presentation linking to the latest one from them, an April 2007 report, since the data was just too far out of date now. Well, I was very pleasantly surprised to hear about a new full Technorati report on the horizon from Greg Jarboe’s post at SearchEngineWatch.com (one of my favorite places to stay-up-to-date on everything Web-related) late yesterday afternoon, and I look very much forward to reading and sharing the entire report. As of this morning, two of the five segments of the report, to be “released in five consecutive daily segments” are available, and this year’s report provides a lot of data thus far and it surveys many bloggers. While you wait for segments 3-5 of the full, detailed report, get started by reading the “Introduction,” Segment/Day 1: “Who are the Bloggers?,” and Segment/Day 2: “The What and Why of Blogging” over at Technorati. Do take the time to visit, because if you have any interest in the latest impact and trends associated with blogs, you will be educated and impressed with the detail of their latest report–I certainly was!